Inventory We are a resale marketplace, not a box office or venue. Ticket prices may exceed face value. This site is not owned by Viejas Arena at Aztec Bowl . 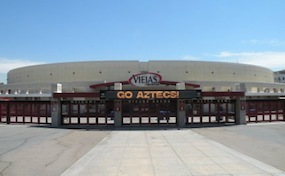 The Viejas Arena at the Aztec Bowl is home to the San Diego State University men's and women's NCAA basketball teams. The venue was known as Cox Arena until its 2009 name change. The Viejas Arena box office is located at 5500 Canyon Crest Drive on the SDSU campus in San Diego, California. The arena opened in 1997 and has a maximum seating capacity of 12,845. Viejas Arena tickets have included popular traveling concerts like Lady Gaga, Van Halen, Foo Fighters, Metallica, Green Day, and Paul Simon. The arena has also held WWE events and the NCAA basketball tournament. It is known as Viejas Arena at Aztec Bowl because the venue was built on the old grounds of the Aztec Bowl stadium. ArenaSanDiego.com is not currently associated with any official box office, venue, website, or primary supplier. We are a privately owned and operated company that specializes in all sales in the secondary ticket market. Prices on the site may be well above or below face value and can change rapidly with market conditions. To order tickets to all Viejas Arena at Aztec Bowl events simply follow the easy to navigate instructions online or call our friendly operators who are standing by at anytime.